Like many people on the Autism spectrum, I have a LOT of sensory sensitivities that can be extremely distracting, distrustful, and overwhelming… textures, tastes, sounds, smells, you name it. Throughout the years, as I’ve become more self-aware, I have learned lots of very easy simple little fixes and workarounds to mitigate my hyper-senses. Sure, the problem is disabling, but the solution is quite often exactly the opposite, and it’s the little fixes that make a BIG difference for me. I’m extremely sensitive to textures. Food is a big issue for me due to that, but clothing also plays a major role. Unlike a lot of autistic kids, I never preferred to be naked. In fact, I HATED it (and still do). I need to have clothing covering as much of my skin as possible, to shield it from external shifts and changes. I can’t stand it when air hits my legs/arms/belly/skin, etc. The changing air currents are distracting and I’m really sensitive to the way they hit me. It can make my skin crawl, make my stomach churn, and send me tail-spinning into “agitated-flappy-land”. I do have issues with certain fabrics, especially most dress-clothes – they’re too smooth, so I wear the same thing nearly all of the time – jeans, t-shirt (or long sleeved t-shirt), fleece jacket or sometimes hoodie. I don’t like brushing up against anything directly on my skin, so I keep mostly covered. It helps that I’m nearly always cold, so staying bundled up serves 2 purposes at once – yay! One of the easiest and simplest ways that I solved my sensory sensitivity issues was with my feet. I nearly always wear socks. And when I’m NOT wearing socks, I am standing on either a towel (eg. after a shower), or on a carpet. I like having a layer between me and the outside world. A thin layer, so that I can feel how the ground contours under my feet, but not so that I also feel the textures up against my skin – uniform micro-texture does wonders for me. And so I wear socks everywhere, nearly all the time. In fact, I prefer socks over shoes, because I love feeling the ground through my socks. I just prefer to put a barrier between my skin and the ground. 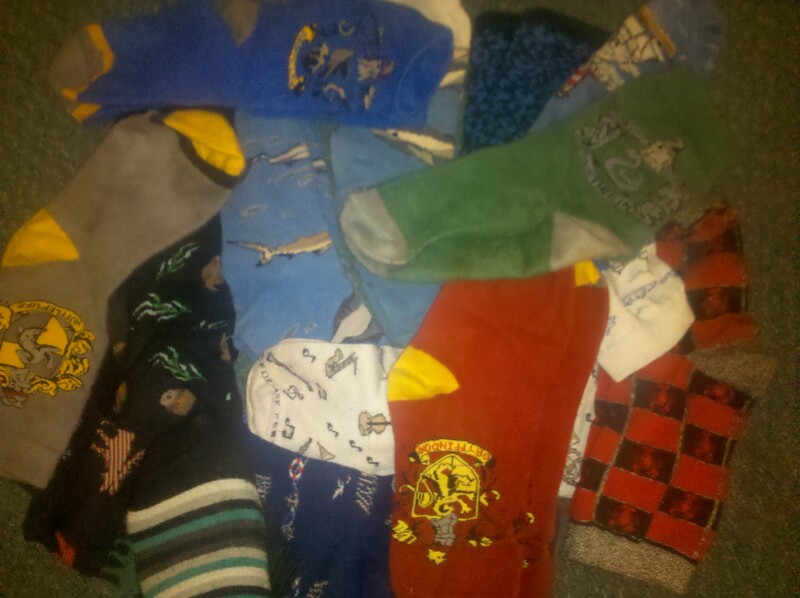 And so, I have a special place in my heart for socks. I don’t like just any socks, they have to go up at LEAST mid-shin. None of those little ankle socks, because if I move wrong, my pants might bunch up and allow air between the sock and the jean, making my ankles and lower legs uncomfortable. I’m also very picky about the texture of the socks themselves – they have to be soft, but not too squishy. And none of those boring white athletic socks either (except in very specific circumstances – they have an OK texture, but its boring). I wear “fun” socks. Socks with animals on them. Socks with stripes and rainbows. Socks with musical notes. Socks with all sorts of patterns. I have a set of Harry Potter House Socks (of course, my favorites are Ravenclaw – not just because that’s the house I would be in, but because they’re blue, too – my favorite color), and socks with science-y things on them. Soft socks with patterns make me super duper happy. In fact, on my birthday, I ask people for socks. Because sadly, the socks I like are usually expensive ($7+ per pair), and I have killer big toes, that no matter how short I keep my toenails, they still manage to wear holes in them rather quickly. Once a sock has a hole, it’s sadly time to say goodbye to it, as I can’t deal with the sensation of my toes going through holes. But I can’t throw them out – they’re special. So instead I repurpose them. I sometimes cut holes in the heels to make arm-socks (for when it is really cold in the lab), or I use them for various crafts. Socks make me very happy, and are a wonderful way to regulate my sensory system, to boot. (No pun intended – I only noticed it on my 3rd read-through. But take it as you may.) Yay for socks! My posts will be shorter and less frequent for a little while, as I’m very involved with school this quarter (oral exam that tells whether I stay or go is in less than 2 months! ), and the reading alone leaves no time for anything else at all. I’m going to make this into a series, though – I have all sorts of little things I do to help keep my sensory system calmer, and keep myself functional throughout the day, so I’ll be sharing them in little snippets. At least that’s the plan. If you enjoy my blog, or have gotten something useful out of it (or I hope, both :)), please consider voting for it on Babble – click on the blue badge on the right-hand sidebar. Thanks for reading! Aww thanks on many levels – the comment, the vote, and everything 🙂 The barefoot running shoes wouldn’t work for me for one other very important reason that I forgot to mention… NO TOE SOCKS. I can’t stand it when there’s stuff between my toes – it’s the same sensation as my toes going through holes in the socks… I actually also prefer shoes I can tie very tightly. No flip flops, no slip on shoes, they must have a back, etc. Someone has a few quirks, might I say? Yeah, sounds about right. 🙂 I definitely identified with it when it appeared, too… thanks for reminding me about it! E, you have really made me aware of how big a role sensory issues can play in a person’s everyday life. I’m thinking that many of my son’s “behavior problems” have been caused by sensory problems. Your skin surface would seem to be “hyper-sensitive.” I think my son’s skin is “hypo-sensitive.” He used to insist on being naked (which becomes a problem socially after about age 3). It was a constant battle at home. Jason will still take a brush and rub it hard over his skin, over & over. He used to jump from heights in his bare feet (landing would hurt my feet, but he liked it!) He was always turning his shower water to “Hot,” making his skin red from the hot water (another battle) He seemed to need stronger sensory input than most people. He lives in a group home now, and he follows their rules. I don’t know how he is feeling– he seems calm most of the time (of course, he is on several meds to keep him calm & compliant). He wears clothing all the time now, and doesn’t climb on the tables & countertops and jump off them. I don’t know if he is happy. He was acting too sleepy and lethargic to me for a time; so, I asked his doctor if they could try decreasing his meds. She has successfully decreased two of them, and he is more alert and his face is more expressive. I so wish my son didn’t have to be drugged! He just gets too agitated and even aggressive without the meds. Anyway, I really want to learn more about sensory issues. Maybe there are ways I can help Jay to deal with his issues. Just understanding more about sensory issues helps me to understand what my son might be going through and reacting to! Thanks once again for valuable info– and for “listening” to me. Hy Lynne, thanks for such an insightful comment. 🙂 Yes, a lot of my “behavior” issues are also sensory. My sensory system is on “high” and often on overdrive. The one sense I’m more hypo than hyper is pain – I almost never feel pain until its way too late. It took me years to figure out the little bit I do know about my senses, and just knowing at all about autism was the biggest thing for me… knowing how autism mainfests itself and saying “oh, I get it now”, and then reacting accordingly. For years I tried to “pass” and failed. Now I don’t try to pass, and I acknowledge my challenges and answer them too… funny, now I’m doing so much better! Yep 🙂 I had you in mind when writing this… socks are amazing!!! I sported only those short, loose-fitting, 1980’s running shorts. I loved the feel of the air on skin, I particularly loved feeling contrasts with my feet– gravel, slate, marble, grass, mud, silt. I looked up the word whore-monger and was perplexed. As during that period of my life I was beyond naive and was asexual. When I sleep, my feet usually remain outside the sheets and duvet; they will kick to get free. Perhaps it is due to always having to sit on my hands in school to stop “fidgeting”; my toes and feet stim. Yep, exactly! Except when the socks get wet… but really, it’s a wonderful protective layer. 🙂 Thanks for the comment! So glad to see the blue badge on your site E. I’ve voted and I know at least a half dozen others who have voted for your blog as well! Em is both hyper and hypo but on the sock issue she would prefer to never wear them. She tolerates them and because the heels of her feet crack and bleed, we try to keep her in socks. She also would prefer not to wear clothing, but since she must, she likes soft and stretchy fabrics (unless it’s a pretty dress, in which case she will wear any fabric as long as its “pretty.”) when it comes to pain she can get a tiny scratch and scream in pain, but then pull a loose tooth from her mouth and toss it to the ground. It’s almost impossible to know which it will be. Her ears and sensitivity to air pressure – hyper, movement, like roller coasters, swinging, twirling etc – hypo. It keeps all of us on our toes. I’m so glad you’re talking about the sensory issues because for Emma they are hugely significant and something that is greatly downplayed in the larger conversation surrounding autism. I really enjoyed this post. Maybe some day you can share some pics of your repurposed socks. Wow! just wow! we are in the middle of getting my husband assessed for autism / aspergers and I had never thought about his socks. He wears socks all the time and I tease him about wearing them even during intimate moments. He likes to wear them pulled up high, if he is wearing shorts he still wears his socks pulled up. I remember the joy when I got him new socks that actually hit, he was so happy, I thought it was a bit weird, but after 30+years of wearing too small socks he was like a kid at Christmas with socks that fit. I had to order them online through a specialty store as he has size 16 feet, but he was so happy it was worth every cent. M. never has liked being naked either and is more likely to wear more clothes so I get this one. Mahalo for sharing your experiences! Sensory sensitivities like everything else is not one size fits all. My son is very particular about his socks, they have to feel “just right” and fit “just so” as well, he won’t tolerate any kind of trainer or ankle sock, and he actually screams if he accidently stands in anything wet. My daughter will mostly wear any sock as long as it is on perfectly straight (which can take several tries) and she too loses the plot if a sock gets wet. As a parent of Aspergers children I am always learning. Great post. Such a great post that speaks volumes about sensory issues. My son has severe sensory issues and they also lend to behavior problems. Mornings getting dressed can be tricky because I can’t really get him to wear different things. Socks he needs to have because he can not tolerate anything touch seams (seamless socks of course) but otherwise he is a barefooter and despises shorts. 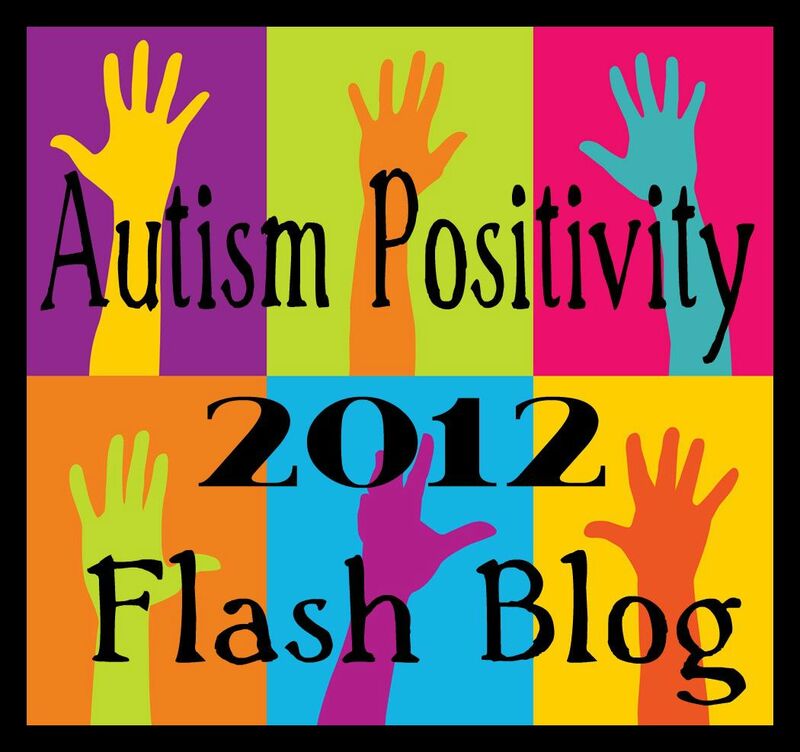 As soon as I saw the title “Socks and Autism” I gave an inward groan and jumped on the link. Sensory issues are the bane of my existance – rather, my son’s sensory processing disfunction is; and socks are the source on many needless powerstruggles (on my part). After reading the post I found myself quoting Dumbledore,”I see myself holding a pair of thick, woolen socks,” and wishing I was wearing them myself. Aww 🙂 I’m just lucky I guess – for me socks are essential, rather than awful. Thanks for the comment and I’m glad you enjoyed it. 🙂 Thick woolen socks would be ucky for me – too scratchy! Socks! Another example of how diverse the spectrum is. My son and I can’t tolerate the sensation of socks on our feet unless it is outrageously cold. The constriction and captured moisture is too much to bear. Yet, the floors must be perfectly swept lest we encounter a bit of grit. I recently abandoned socks altogether because they were actually hurting my feet. And they always shrink in the wash making constriction worse. So in spring, summer and autumn you will find me in flat slip-on sandals, and in the cold months in the most comfy boots I can find (preferably sheepskin, like my slippers) but sockless, and at last without tired feet. Full-length soft stretch leggings keep me warm and mobile right down to the ankles and look like black tights. Foot comfort is so important! Aww I’m so glad you relate 🙂 Thanks for the comment! I used to be unable to stand socks, but I sometimes even enjoy them now. However, I was one of those children that preferred to be naked. xD Clothes, unless they are very soft, seem rather unnecessary! Also relate to this (and the nail trimming post but in a different way). For years, without THICK socks I walk on the outside of my feet which freaks people out – only recently realized it is due to feet-based sensory overload! The outer edges are the least sensitive after all!